Publications - Management Consulting - Chemicals Ltd. This is a chronological list of publications. For papers grouped by topic (with links for downloads), please see the Knowledge section. All papers available for download are also listed there. However, some papers (particularly early ones) which are not available for download are only listed in the Publications section. "Renewable Energy as a Market Opportunity for Chemicals in China"
"What is the difference between acquiring a chemical company in China and in the Western world?" "Economic Impact of Tightened Environmental Regulation on Chinese Chemical Industry"
"Akquisitionen von Chemieunternehmen in China"
"Automotive Developments and Implications for the Chemical Industry in China"
"Improving energy generation for China`s chemical industry"
"Impact of tightened environmental regulation on China´s chemical industry"
"Sustainability - Already a Topic for China´s Chemical Industry?" "Konsolidierung und Modernisierung. Acht Hypothesen zu den Entwicklungsmöglichkeiten der Chemieindustrie in China bis 2025"
"What′s Next for the Chinese Chemical Industry? An outlook to 2025"
"The Cases for and Against Foreign-domestic Joint Ventures in the Chemical Industry in China"
"Chinese Outbound Acquisitions of Foreign Chemical Companies"
"China′s Belt and Road Initiative (BRI) and the Chemical Industry"
"Stock Market Performance of Chinese Chemical Companies 2015-2017"
"Upgrading of the Chinese Chemical Industry - China's Focus on Environmental Protection Provides an Opportunity for Equipment Producers"
"Recent Developments in Electric Passenger Cars and Implications for Chemicals in China"
"Industry 4.0 and the Chemical Industry in China"
"Chemical Parks in Europe and China: Similarities, Differences, Learnings"
"Not Quite World Class Yet: Process Optimization Potential at Chinese Chemical Producers"
"Stricter Regulation as An Opportunity for Chemical Companies in China"
"Chemical Parks in China: Status, Developments and Issues"
"Recent Regulatory Developments in Plastics Additives in China"
"Developments in China's Automotive Market and Impact on Plastics"
"Does Ownership Type Matter? The growth of China's chemical market is primarily captured by private domestic companies"
"Challenges Evolve In China - Domestic Chemical Market Changes as Country Seeks Wider Global Role"
"China's coatings market: a mid-year update"
"In der Mitte liegt die Kraft - Chinas Farben- und Lackmarkt"
"Electric Vehicles as An Opportunity for the Chinese Chemical Industry"
"China´s Mid Level Chemicals Markets"
"Time for cooperation? The Chinese and Western European Coatings Market"
"Gelegenheit zur Kooperation? Der chinesische und der westeuropäische Lackmarkt"
"Regulation as a Driver of Innovation in China's Chemical Industry"
"Chemical Regulation in China and Europe"
"Complexity as a key entry barrier in the chemical industry"
"China - the Future of Chemical R&D"
"Invented in Shanghai? Chemical R&D in China"
"Chinas 13. Fünfjahresplan und die Chemische Industrie: Ein kurzer kommentierter Überblick"
"China - Becoming A Net Exporter for An Increasing Number of Chemicals"
"The Chemical Quotient - New Measure to Compare Locations for Chemical Investments"
"Challenges and Opportunities for Agrochemicals in China"
"Der Chemie-Quotient - Neue Maßzahl veranschaulicht die Bedeutung der Chemieindustrie in verschiedenen EU-Ländern"
"Measuring China's Importance - Chemical Quotient Quantifies Relative Status of Chinese Chemical Industry"
"The Tianjin Explosions and Their Implications"
"The Way to Go? M&A as Growth Path for Chinese Chemical Companies"
"Internationale Konzerne nur noch zweite Wahl? Attraktivität von multinationalen und staatlichen Chemieunternehmen als Arbeitgeber in China"
"No Longer the Employer of Choice? Attractiveness of Multinational Chemical Companies versus State-owned Enterprises for Mainland Chinese Chemical Professionals"
"E-Business and Chemical Distribution: Disintermediation 2.0 ?" "The Importance of China as Global Chemicals Market, as Measured by the Chemical Quotient (CQ)"
"Complementary Capabilities? Opportunities for Chemicals Trade between China and India"
"Intellectual Property in China's Chemical Industry"
"Challenges and Opportunities for the Global Chemical Industry"
"Coatings in China: Present and Future"
"China´s Chemical Industry: The Case for Knowledge Management"
"Shale Booms into Plastics Export Market. How much margin will US producers leav on the table?" "Wanhua- The challenges of establishing a global presence"
"Local Lead. Why Are Foreign Chemical Companies Growing More Slowly in China?" "Chemistry´s Contribution to China´s Present and Future"
"Improving China´s Domestic Chemical Companies"
"Correlation between Ownership Type and Sales/Profit Growth in China´s Chemical Industry"
"Custom Synthesis for Pharma and Agrochemical Companies"
"Renaissance einer ‚alten‘ Technologie. Pro und kontra Kohlechemie - die Zukunft in China trotz zahlreicher Herausforderungen?" 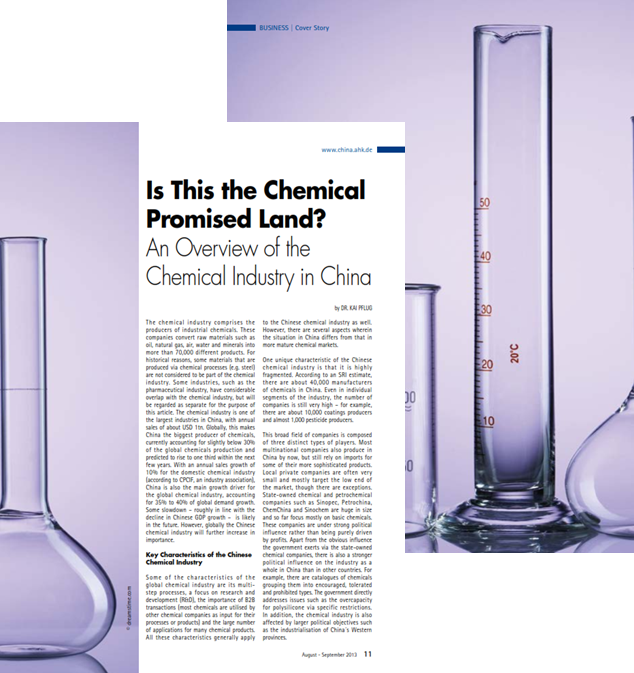 "Attractive areas in China´s chemical industry"
"Why Are Foreign Chemical Companies Growing More Slowly in China?" "Coal Chemicals: A Preliminary Evaluation"
"China Tackles Its Major Economic Issues - An Examination of the Government Influence on the Chemical Industry in China"
"Attractive Segments in the Chinese Chemical Industry"
"The Strategy Development Process of Chemical Companies in China"
"Huayíng Dào Zhongguó - Voraussetzungen für den Erfolg als Expat-Manager in der chinesischen Chemieindustrie "
"Implications of the Closing Wage Gap between European and Chinese Chemical Industries"
"Successful leadership in a multinational chemical company in China"
"Catching Up —The closing wage gap between the European and Chinese chemical industry, and its implications"
"Countering Commoditization. The Aging of the Chemical Industry"
"Classification of chemicals in the commercial area"
"The Chemical Industry in China and the Middle East: Cooperation or Conflict?" "Commoditization or the Aging of the Chemical Industry"
"Western Players and the Chinese Chemical Market. Is the Playing Field Level?" "Chinese Acquisitions Gives Local Access to Foreign Chemical Companies"
"Chemical parks and site selection for chemical production in China"
"Change in China. Transformation of the Chinese Economy and Consequences for the Chemical Industry"
"Recent acquisitions of chemical companies in China by multinational companies and their rationale"
"Is this the Chemical Promised Land? An Overview of the Chemical Industry in China"
"Chinese Chemical Industry and Environmental Protection Tightened Regulations Not Always Transparent for Western Companies "
"The transformation of the Chinese economy and consequences for the different segments of the chemical industry"
"Target search in the Chinese chemical industry"
"Working as an Expat in China"
"Was müssen westliche Chemiker in chinesischen Chemieunternehmen beachten?" "The Future of Fine Chemical Production - Chemical Production in Asia vs. the West"
"Intellectual Property Safeguards in China"
"China’s Midmarket - How Domestics and Multinational Companies Compete"
"Market Drivers – Trends in the Chinese Chemical Industry"
"Private Equity in the Chemical Industry (II)"
"Private Equity in the Chemical Industry (I)"
" Still Small: China’s Bioplastics and Biodegradable Plastics Sector Relies on Beijing’s Support "
"Catching Up: The Use of Engineering Plastics in China’s Auto Applications Industry is Growing"
"Some HR issues of MNCs in the Chemical Industry in China"
"China Increases Self-sufficiency in Commodity Plastics"
"Clean Technologies and the Chemical Industry in China"
"Lessons from the History of the Global Chemical Industry for China''s Companies"
"Chemicals Distribution in China - A long Way to Go to Reach Global Standards"
"The Mid-market for chemicals – competitive battleground between domestic cmpanies and MNCs"
"Intellectual Property Protection - An Overstated Risk of Doing Business in China?" "Basic Chemicals in China - Different Issues for Multinationals and for Domestic Chemical Companies"
"Chemical Industry R&D Cooperation in China. An Underutilized Opportunity"
"Is Coal Chemistry Really the Future for China - An Opinion"
"Plastics in Automotives - No Longer Too Early for China"
"Feels Like Home. Localization, a Key Success Factor for Doing Business in China"
"Risk Management in the Chinese Chemical Industry: towards A More Structured Approach"
"The Global Fine Chemicals Industry Is Shifting towards China"
"R&D Cooperation with Multinational Chemical Companies – an Underutilized Opportunity for China"
"Strategy Development in China´s Chemical Industry by Foreign and Domestic Companies "
"Business as usual? Strategy development in the chemical industry in China"
"China should have a domestic specialty chemicals champion"
"Different Approaches for a Complex Sector"
"Localization – Key to success for multinational chemical companies in China"
"Winning Formula – There is a Role for Chemical Makers in Clean Technology"
"Getting Innovation in China right"
"Accelerating Growth. China´s Mid-level Chemical Market Offers Opportunities for Western Companies"
"Location, Location, Location. How to Search for a Chemical Site in Asia"
"Between Ambition and Reality. Environmental Protection in China"
"Getting Innovation right. Overcoming obstacles to innovation in the chemical industry"
"Managing the effects of the business cycle in the chemical industry"
"Umweltschutz und die Bedeutung für die chemische Industrie in China"
"Entwicklung kreativer Marketingideen in Chemieunternehmen"
"Big Trouble In Big China. How Serious are Environmental Concerns?" "Dienstleistungen als Geschäftschance für die chemische Industrie"
" Getting The Price Right. Value Pricing in the Chemical Industry"
"Conjoint Analysis: Learning about Client Requirements in Chinese Chemical Industry"
"Wenn zyklische Geschäfte zum Problem werden. Wie Chemieunternehmen die Zyklizität ihres Geschäfts reduzieren können"
"Conjoint Analysis: Decide on measures. Client requirements in the chemical industry"
U.S. Patent No. 6.693.143, issued February 17, 2004. "Dental materials having a nanoscale filler"
"Participation Models in Specialty Chemicals"
U.S.Patent No. 6.575.752, issued June 10, 2003. "Tooth surface treatment composition and method"
"Value Pricing – Preise als Hebel für Umsatzsteigerungen"
"Dienstleistungen – eine Chance für die Spezialchemie?" "Im Wandel der Zeit - Herausforderungen für europäische Chemiedistributeure"
"Management von Zyklizität - Zyklizität kann auch eine Chance sein"
U.S. Patent No. 6.399.037, issued June 4, 2002. "Dental materials packaging and method of use"
"Antimicrobial dental materials containing 2,4,4´-trichloro-2´-hydroxydiphenyl ether"
Betriebswirtschaftslehre für Chemiker (Springer Verlag, Berlin 2001), p. 89-101. "Der Prozess der strategischen Planung"
U.S. Patent Application 20010009931 of Jul. 26, 2001. 20010009931 of Jul. 26, 2001. Dental Zeitung 2/2000, 118-119 (2000). "Reduzierte Nettoschrumpfung von nur einem halben Prozent"
"Seal&Protect- a new concept of protecting exposed dentin"
Dentsply Noticias 14, 18-19 (2000). "Un nuevo concepto de protección para la dentina expuesta"
"Seal&Protect- Ein neues Konzept zum Schutz freiliegenden Dentins"
"Seal&Protect: A new concept of protecting exposed dentin"
"Utilizing NRC Non-Rinse Conditioner for stress-bearing Dyract restorations"
"Prime&Bond NT- Introducing nanotechnology to adhesive dentistry"
U.S. Patent No. 6.004.390, issued Dec. 21, 1999. Dentalhygiene Journal 2, 46- 49 (1999). "Prime&Bond NT- How nanotechnology was introduced to adhesive dentistry"
"Neue Möglichkeiten mit Kompomeren der 2. Generation"
Innovationen in der Zahnheilkunde (Spitta Verlag, Balingen 1999), Bd. 2, Teil 18. Asian Dentist Feb-Mar 99, 13-14. "Nanotechnology- A step forward in enamel, dentine bonding"
K. P. Pflug, G. Gomes, J. Perdigao, E.J. Swift Jr.
J. Dent. Res. 78, 392, Abstract #2290 (1999). "Bond Strengths of Acetone-Based One-Bottle Adhesives"
Dentsply Noticias 10, 1-2 (1998). "Cómo se ha introducido la nanotecnología en la odontología adhesiva: Prime&Bond NT"
Journal of Dental Symposia 5, 17 (1998). "Prime&Bond NT- Introducing Nano-Technology to Adhesive Dentistry"
"Photochemistry of (Fulvalene)tetracarbonyldiruthenium and Its Derivatives: Efficient Light Energy Storage Devices"
"Formation and degradation of 1,4-polybutadiene via metathesis: new results concerning cyclic oligomers"
"Synthesis of oligo- and poly(1,4-phenylenevinylene) by metathetic polycondensation of 1,4-divinyl-benzene"
"Metathetic incorporation of preformed defined p-phenylenevinylene sequences into commercially available neodymium butadiene rubber"
UV-Vis-spectroscopic determination of sequence-length distribution of p-phenylenevinylene units"
"Synthesis of copolymers with a controllable sequence length of p-phenylenevinylene units"
"Copolymers of 1,5-cyclooctadiene and [2.2]paracyclophane-1,9-diene: metathetic preparation and structure analysis"